Background/Purpose: Modifiable lifestyle factors such as inactivity and obesity contribute to cognitive decline in the general population, but little is known about how these factors may contribute in the setting of a chronic inflammatory condition such as Rheumatoid Arthritis (RA). We studied the clinical and functional risk factors related to a decrease in perceived cognition function in patients with longstanding RA. Methods: We collected data on joint exams, serologies and detailed clinical, psychological, exercise and functional outcomes over 10 years in a prospective academic RA cohort. Self-reported memory, concentration and word-finding difficulties were assessed yearly by questionnaire and graded from “never” to “often”. A repeated measures logistic regression model using pairs of years examined the role of exercise (defined as those meeting the Dept. of HHS physical activity guidelines of 75 minutes of vigorous or 115 minutes of moderate aerobic activity per week), Body Mass Index (BMI), sleep and depression (MHI-5) in the first year (T0) to the progression of cognitive complaints described as “often” 1 year later (T1). Regression models also adjusted for other clinical and demographic variables including DAS-CRP3 score, DMARD and corticosteroid use. Results: Of 1219 RA subjects, 127 (10.4%) described either poor memory, poor concentration or word finding difficulties as affecting them “often” at the first study visit. Only the perception of memory difficulties increased over time (R2=0.64, test for trend, p=0.006). RA patients, (mean age. 56.5 years, 82% female, 58% with a college education) were less likely to develop word finding difficulties and impaired concentration if they met the Dept. of HHS physical activity recommendations (p<0.0001; p=0.0002, respectively). Concentration worsened among those RA patients who were female (p=0.03), had a higher DAS28-CRP3 score (p=0.04), and higher MHI-5 depression scores (p=0.05); RA patients taking an anti-TNF therapy were less likely to develop worsened memory complaints (p=0.0004). Sleep, BMI, fatigue and medication use, such as methotrexate or corticosteroids, were not independently associated with a worsening of any of the cognitive complaints, adjusting for other covariates. Conclusion: Clinical factors such as lower disease activity and anti-TNF use reduced the likelihood of worsened memory and concentration over time. However, meeting the Dept. of HHS guidelines for physical activity was protective against an increase in concentration and word retrieval difficulties. 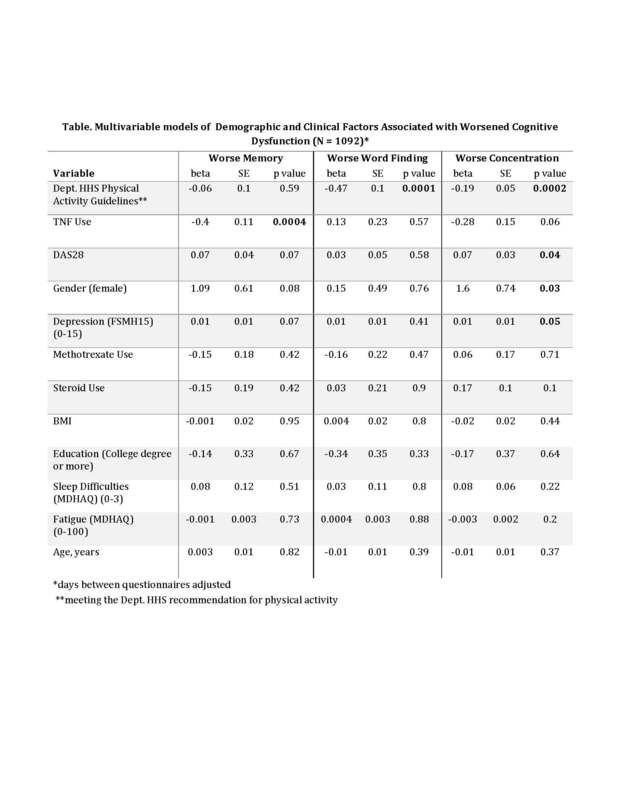 Our study suggests potential modifiable risk factors for the prevention of cognitive dysfunction in RA. Disclosure: N. A. Shadick, Amgen, Mallinckrodt, Bristol-Myers Squibb, Sanofi-Regeneron, 2,Bristol-Myers Squibb, 5; C. K. Iannaccone, None; P. Katz, Bristol-Myers Squibb, 2; G. L. Maica, None; J. Coblyn, None; M. E. Weinblatt, Amgen, BMS, Crescendo Bioscience, Sanofi/Regeneron, 2,Abbvie, Amgen, BMS, Crescendo Bioscience, Corrono, GSK, Gilead, Eli Lilly and Company, Lycera, Merck, Novartis, Pfizer, Roche, Samsung, Set Point, UCB, 5,Lycero, Can-fite, Scipher, Vorso, Inmedix, 1; J. Cui, None. Shadick NA, Iannaccone CK, Katz P, Maica GL, Coblyn J, Weinblatt ME, Cui J. The Impact of Exercise and Clinical Factors on Perceived Cognitive Function in Patients with Rheumatoid Arthritis: Results from a Prospective Cohort Study [abstract]. Arthritis Rheumatol. 2018; 70 (suppl 10). 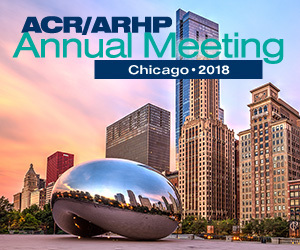 https://acrabstracts.org/abstract/the-impact-of-exercise-and-clinical-factors-on-perceived-cognitive-function-in-patients-with-rheumatoid-arthritis-results-from-a-prospective-cohort-study/. Accessed April 21, 2019.